If you've got quartz countertops, you've got extremely durable, unbelievably attractive, and incredibly classy countertops. quartz is an investment, but, fortunately, it's also easy to keep clean and maintain. One of the wonderful things about cleaning quartz countertops is that, in most cases, all you need is water and a paper towel. All you have to during routine, day-to-day cleaning is get your paper towel wet with a little water then wipe down your quartz countertops. Even though quartz is incredibly durable, it can still be damaged by prolonged exposure to acidic liquids such as wine, vinegar, lemon juice and soda. Cleaning quartz countertops is easy, especially if you take steps to keep them clean in the first place. There are, however, certain things that can cause problems. Permanent markers, cooking grease that has been on the countertops for long periods of time and fingernail polish, for example, can all leave your quartz countertops stained or dulled in appearance. If you have any of these problems with your quartz countertops, don't fret. There are steps that can be taken to restore their natural beauty. 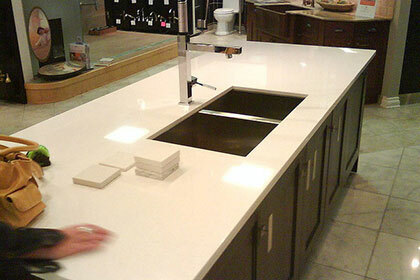 Contact the quartz countertop fabricators at JSC Stone today to talk about your options.